The Miami Dolphins have not had a quarterback since Dan Marino days and right now it is Matt Moore’s job but for how long? Only time will tell whether the Miami Dolphins are satisfied with Moore under center. In taking a peek out into the free agency market and who could be on the trading block soon names like Peyton Manning, Matt Flynn, Jason Campbell, Kyle Orton, and Donovan McNabb fill the chart. With that, who fits best with the newly acquired coach as the big man taking snaps? In evaluating who fits the job it comes down to age, career statistics, and who can come in and learn the offensive scheme of coach Philbin right away. So let’s start off with the obvious. 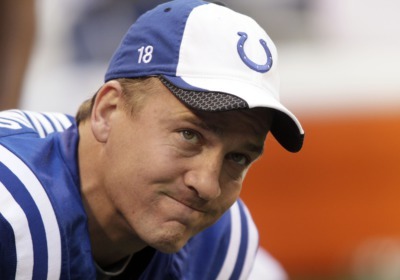 Manning in Indy but for how long? Peyton Manning is a hot commodity and as well he should be. Manning is a 14-year veteran, who can help a team out like the Miami Dolphins. The only missing piece the Dolphins need is a quarterback. Don’t get me wrong Matt Moore had one heck of a season in posting 2,497 yards, 16 touchdowns, and nine interceptions but if you can get your hands on a player like Peyton Manning, there is no doubt the Dolphins would inevitable to not propose a trade. Yes the man is 35 years-old but if you have Manning as a starting quarterback in your clubhouse hopes are elevated. Also, this is an ideal situation for the long time Colt quarterback. He will be surrounded some young, fresh, and high caliber players in Pro Bowl MVP wide receiver Brandon Marshall, running back Reggie Bush (coming off a 1,000 yard season), Pro Bowl offensive lineman Jake Long, and statistically one of the better defenses in the NFL. Manning would run this offense like no other, whether it be dishing off passes to Reggie Bush in the slot or throwing the long ball to one of better wide receivers in today’s game. Another ideal situation would be bring in quarterback Matt Flynn. He was in the Packers‘ quarterback depth chart for four years but now he is out there on the market. Does he follow his fellow former offensive coordinator? It totally makes sense from both perspectives. One, he can come into the organization and know what he is getting himself into. Two, he would be cheap for the Dolphins to retrieve. This kid has shown he can play. In week 17 this past season against the Detroit Lions he made name forhimself throwing 480 yards, six touchdowns, and one interception. As far as Jason Campbell, Kyle Orton, or Donovan McNabb goes, they are complimentary quarterbacks that are at a point in their careers where they need to flash some light on their veteran presence in the National Football League. Campbell and Orton still have some left in the tank but good ole McNabb is running on empty. The quarterbacks Peyton Manning and Matt Flynn would better the Dolphins playoff chances in the short term and long term. In regards of Manning’s injury, he came out and said he is ready to play but his agent says no timetable set quite yet. 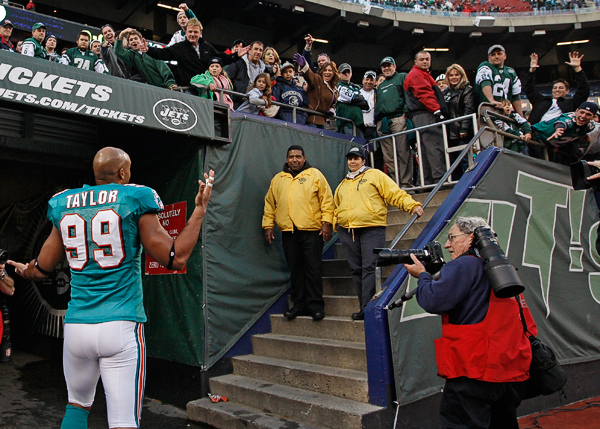 The Miami Dolphins had nothing to lose in this game and crushed the Jets’ playoff hopes. The Dolphins finish the season winning five of their last seven games. With Reggie Bush absent in this game due to a right knee injury, there had to be a force on the ground and it came from former West Virginia Mountaineer Steve Slaton. He filled the void in the backfield racking up 55 rushing yards. Dolphins’ quarterback Matt Moore yet again finds away to survive throughout battles. He tallied 135 yards, one touchdown, and two interceptions. Even though Matt Moore’s performance was unattractive he receive some power within his receivers Brandon Marshall and Davone Bess. Throughout this 2011-12 season, the Dolphins have recorded a total of 13 interceptions. On New Year’s, they brought their “A-game” intercepting Jets’ quarterback Mark Sanchez three times. Mark Sanchez’s performances late in the season were terrible. Sanchez continued to put the Jets in an unknown territory. He has been inconsistent when the empire needs him most. The New York Jets lost their last three games. A rough ending and not a good start to the new year with some questionable calls and actions on their sidelines. 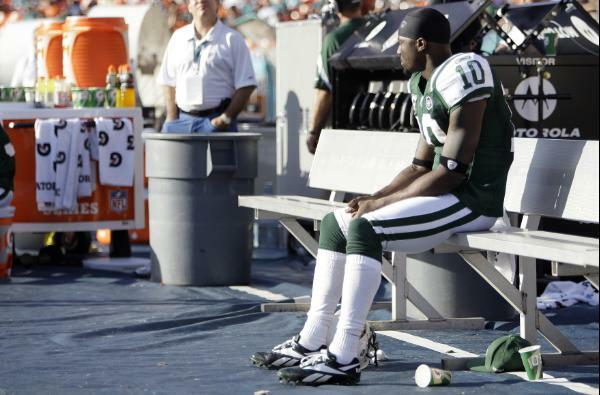 Sitting in the farthest bench away from the vision of the field appeared an angry Santonio Holmes. With Jets losing by nine points there was still time on the clock to make a comeback and he basically made an “all she wrote” kind of action. Miami Dolphins need to rethink this season over. After starting off the season with a horrendous 0-7 record, the Dolphins turned had to turn it around and did giving their season a whole new twist. As for the Jets, they need to find their identity within their franchise whether it be dumping Mark Sanchez or a coaching change. Both teams need changes throughout their organization. We will see what each time has in stored for the off-season. As for Jason Taylor, keep an eye out for his feature post coming soon. Miami Dolphins’ tight-end Anthony Fasano will be watching Sunday’s game against the New England Patriots on the sidelines with a head injury. He did not pass the protocol tests in time to be cleared for Christmas Eve’s game. Quarterback Matt Moore came back from a concussion last week also, so the head injuries are coming often within the Dolphins. There were questions in when he could have been concussed and I can not think of where he could have hit his head. Regardless, he is out for Sunday’s game and full back/tight-end Charles Clay will get the start. Fasano has been a major target down-field for quarterback Matt Moore but so has Charles Clay. This will not effect the Dolphins’ play calls. Keep an eye out for the Dolphins vs. Patriots Christmas Eve preview tomorrow. Todd Bowles was granted his first win as the Miami Dolphins (5-9) defeat the Buffalo Bills (5-9) in impressive fashion 30-23 Sunday afternoon. The questions involving if running back Reggie Bush can be an every down back are slowly evaporating as the former Trojan had a field day. Bush rushed for career-best 203 yards in the victory, he is now 27 yards shy of a 1,000 yard season. Going into the game there were no doubts that the running game would show up but how about the Dolphins’ passing game? Quarterback Matt Moore showed no effects of the mild concussion he experienced in week 14, in connecting on two touchdowns involving a 22-yard pass to tight-end Anthony Fasano and a 65-yard pass to wide receiver Brandon Marshall. Buffalo had trouble scoring throughout the whole game. Bills’ running back C.J. Spiller scampered 24 yards for a touchdown. The former Clemson Tiger finished with 167 all-purpose yards and two touchdowns. Ryan Fitzpatrick, the Buffalo Bills’ quarterback, had a jagged day giving up three interceptions. Two of them caught by Miami Dolphins’ cornerback Vontae Davis. The snow was pouring down all game and you would think it worked in the advantage of the Buffalo Bills, but the cards didn’t fall their way. Miami converted the cold into some fun as running back Reggie Bush sealed the victory sliding into the end zone. 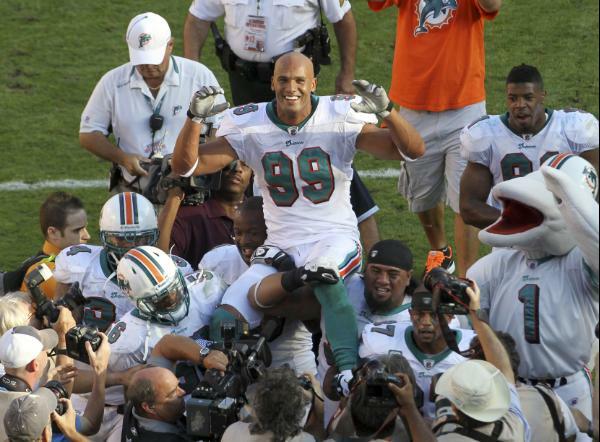 The Miami Dolphins have won five of their last seven games and get a victory in the debut of their interim coach. I wouldn’t count on Bowles becoming the head coach but if he can help this team win out, he could state an argument.